I’ve interviewed many scientists about their work and lives. Some of these were part of longer profiles and articles. Others were Q&A-style interviews. For the Ladybits blog on PopSci I interviewed science historian Christine Aicardi about her analysis of Francis Crick’s time at the Salk Institute. 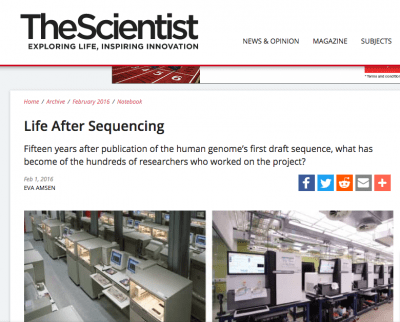 For The Scientist I tracked down a few of the hundreds of authors of the landmark human genome papers on the 15th anniversary of the sequencing of the human genome, and looked at how their experience working on this historic project had affected their careers.